Okay, so originally I said that I would continue to post all my book reviews here as well as on the What Am I Reading Blog. Based purely on today's lack-of-interest inspired mood, I've changed my mind. 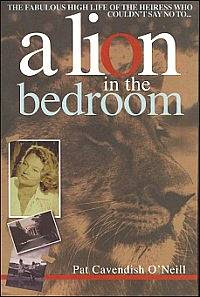 I've finally finished reading the lengthy A Lion in the Bedroom by Pat Cavendish O'Neill. Here Pat tells the story of her charmed life among the glittering names of the twentieth century – Woolworth heiress Barbara Hutton, the Duke and Duchess of Windsor, Gianni Agnelli, Princess Grace and the Hollywood crowd – and the day everything changed for her, when she was presented with a tiny lion cub and she entered a world more magical and inspiring than anything she had known before. And of how it all changed for her when she was presented with a tiny lion cub. This was her beloved Tana. This book has taken me absolute ages to read, and not by any means because it was a dull story (it's just pretty lengthy at 600 pages)! I chose it as an out-of-the-ordinary read for myself but after my recent trip to Kenya (and a visit to Joy Adamson of Born Free fame's house), I thought it would be worth it ... and I was right. It is a well-written easy to read book and a fascinating life story. Pat Cavendish O'Neill has certainly lived to experience a many-varied lifestyle. From being a decadent heiress (although a naive one), with enough money to travel around the world many times over (which she did) and have family homes in so many countries to being a dedicated "mother" to more lost animals than one could count. Her story takes you back to a time I can hardly imagine, with experiences I could barely relate to with the common-place-ness of the Royal guests and the long list of famous friends. But in the end, nothing can prepare you for the depth of emotion she manages to convey when she tells the stories of her beloved Tana and the incredibly bond they have. I'd recommend it to anyone who loves a good biography, because this woman has truly lived! Ps. Yes, Prerogative is spelled like that (who would've thought?!? ), I checked. I would've thought. But I imagine that doesn't surprise society.